Recipe courtesy of Barry “CB” Martin, Char-Broil’s America Grills! Excerpted from Char-Broil’s America Grills! Copyright 2011. Used with permission from Char-Broil and Creative Homeowner. All Rights Reserved. "Here’s a technique for grilling rib eyes that starts with low heat followed by an extremely hot finish for searing and crisping the meat." Trim away excess fat from around steaks. Blot excess moisture from meat using a paper towel. Generously sprinkle both sides of steaks with salt. Refrigerate for at least one hour. Remove steaks from the refrigerator about one hour prior to grilling. Lightly brush off remaining salt. Preheat one side of the grill to high and leave the other side off. Spray steaks lightly with the oil and place on the cool side of the grill as far from the heat as you can. When steaks reach an internal temperature of 90°F, use tongs to place them on the hot side of the grill. Sear steaks over direct heat until they reach a temperature of 140°F (rare) to 145°F (medium rare). Turn steaks once, when sear marks appear on each side. 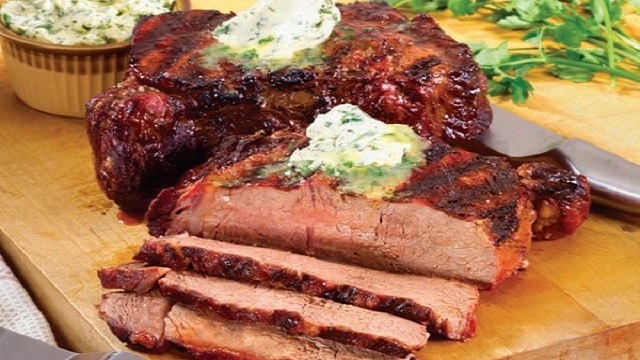 Remove from grill and top each steak with a teaspoon of maitre d’ butter before serving. Maitre d’ butter is simply softened butter, with seasonings, that is rolled and chilled. You can serve it in slices on top of grilled steaks, fish or vegetables. Experiment by combining your favorite herbs and spices. In a large bowl, mash the butter. Add lemon juice and parsley and using a wooden spoon, blend. Spread a one foot square piece of plastic wrap across a work surface and scoop the butter mixture on top. Gently wrap the plastic film around the butter forming a cylinder. Tie off the ends of the wrap with string or a twist tie. Chill or freeze until needed.